Mars Hydro is well-known throughout the growing community although it receives more praise from hobbyists or personal growers than the professional growers. It’s a prominent name, and they’ve manufactured lights for many years before the in-home growing craze began. 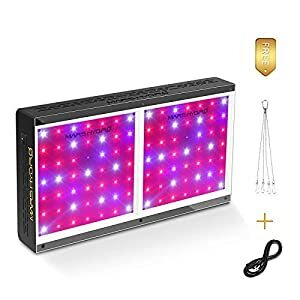 If you’re trying to grow your own plants at home, you need a quality light system. The Mars Hydro reflector series with 300, 600, and 960-watt options is a great choice for many. Many lights claim to offer a full spectrum of light, but the Mars Hydro series delivers. The Mars Hydro series provides 430-440nm, 620nm, 450nm, 650nm, 660nm, as well as white light and infrared. 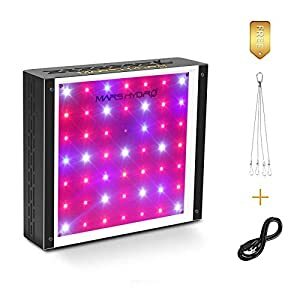 This broad range of light will help your plants from seeding to blooming, offering the best for every stage in between. The infrared lights may not show up because infrared’s not visible to our human eye. If you believe a light is out, it’s more likely that it is infrared. The spectrum from the Mars Hydro series is everything you could want for personal growth. It helps during seeding, cloning, the vegetative state as well as blooming. The Mars Hydro series uses a variety of light rays to balance out your plant’s photosynthesis cycles and growth. There are plenty of red lights present throughout the Mars Hydro LEDs. The red lights can assist inter-nodal spacing through the blooming phase. The idea is that this mimics a summer sun during the day. However, there’s not a lot of information to support this theory. The Mars Hydro series uses reflectors similar to many other manufacturers. These are set at an off-angle to scatter the light downwards without concentrating them too intently in one spot. Don’t forget that plants can sunburn too! The coverage varies between each of the Mars Hydro series because of their size. But even with the largest 960 series it only covers a 3.5’ by 3.5’ area. But the coverage has a lot of intensity which is impressive for the variation in size. The same diodes and reflectors are in each model variation of the Mars Hydro series. This amount of coverage is fairly standard for the size. The reflectors are what significantly impact the coverage area. There is a downside to this coverage area though because the coverage area is standard sized the flowering area is slightly smaller as your canopy fills out. A Mars Hydro 300 series is a great beginner light. The system is incredibly cheap, and the bulbs last for a decent amount of time. The results are comparable to some of the top competitors when it comes to the smaller lighting system. With a lifespan of 50,000 to 100,000 hours, you should expect about 10 years of heavy use. The system also comes with a 1-year warranty. If anything does happen, there is a satellite plant based in California, so you’re not waiting weeks for a repair or replacement. Between the 3 Mars Hydro series options, the Mars Hydro 600 is the best bang for your buck. The mid-priced light system offers all the benefits of the Mars Hydro 300 in a slightly larger size. Its coverage is very even with a chip coverage ratio of 1.53 per square inch. The LEDs used in all of these systems are powerful and last for a long period of time. However, the Mars Hydro 600 gives you the best chip to size ratio. When you go to the larger Mars Hydro 900 model, it’s important to know that the chips per square inch decrease. There are 2 issues that people have with the Mars Hydro series. First that the company is Chinese and second, that the customer service is poor. Although the company is Chinese, that’s no reason to avoid it altogether. Yes, the customer service is not great, but if you really need something you can contact them. Expect long response times, but we haven’t come across many reasons to contact customer service at all. If you do choose the Mars Hydro series, we’ve found that the 600 is the best option of the 3 sizes because you’re getting the most even light distribution. If you need larger coverage area, you’re better with 2 of the 600 units rather than the larger 900 unit. The Mars Hydro series works well through the vegging, cloning, and flowering process. However, you might want to consider lights with more intensity from further distances for the seeding phase. An alternative option is lowering the lights the seedlings receive more intensity. Bad customer service and the fact that these light systems are manufactured in China is no reason to avoid them. Although the Mars Hydro series is not for professional growers, they’re great for hobbyists who need quality lights without the top tier price.